A morning thunderstorm slowed the start of Day One but quickly passed. 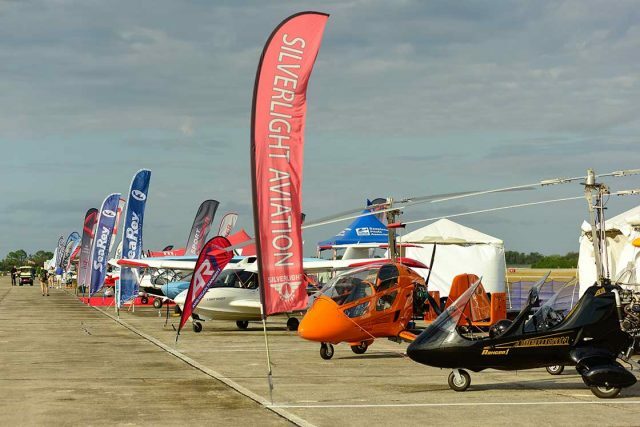 Gyroplanes lined up at the 2019 Sebring Sport Aviation Expo. After a rough event a year ago, in which high winds kept flying to a minimum, this year’s Sebring Sport Aviation Expo got off to a damp and gray start, as a severe storm rolled through Florida, causing widespread rain and forecasts of high winds—up to 60-knot winds were forecast for the Central Florida region. Organizers canceled early morning events and braced for the worst. Luckily, the worst didn’t happen as the airport was largely spared, with strong but much lower winds and only a few moderate showers. By early afternoon the day had turned mostly sunny and crowds started building and airplanes began flying, as VFR skies returned and sport planes began their flybys. The first forum, in the newly dedicated Bob Jones main forum tent, the show’s beloved founder, who died last year, was a panel discussion on the bright future of Light Sport Aircraft, moderated by Plane & Pilot editor Isabel Goyer and featuring longtime LSA movers and shakers Dan Johnson, president of LAMA, Scott Severin, president of US Sport Planes, and Tom Peghiny, president of Flight Design, USA. The panelists weighed in on the state of LSA, big changes that might be in the future of the category, and the challenges that such change might bring. Friday is shaping up to be a big day at the show, with beautiful weather ruling the day. Highlights of the day will include a welcome forum for more than a hundred youngsters with presentations by John and Martha King of King Schools, Barrington Irving of Flying Classrooms, Lindsey Costibe of FunD AV, and Paul New of Workshop to Cockpit Careers. For many, though, the highlight of the event is the sport planes. With dozens of exhibitors in attendance, pilots and current and prospective owners will get a chance to witness up close and personal some of the very coolest machines in the segment. The Sebring Sport Aviation Expo runs through Saturday, January 26. Click the button below to see more photos!